Working on a long-range handgun project that will hopefully be published in Small Caliber News in an upcoming issue. Originally, this project was going to be a .223 Remington, but it has since been changed to a .17 Remington. The .17 Remington is more in line with my interests, and it gives me the opportunity to work with a short barrel .17. 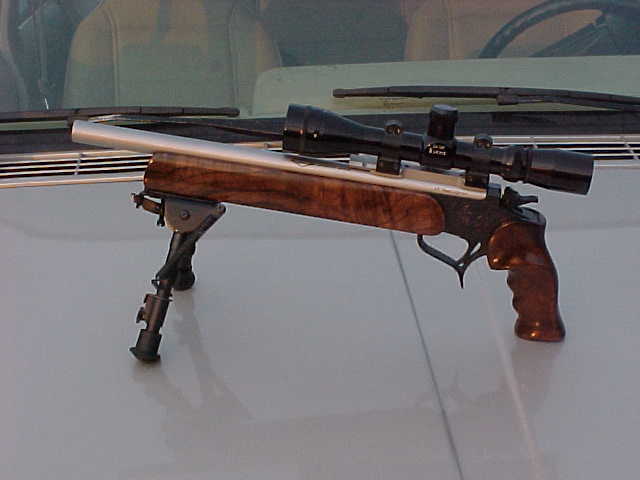 The gun is a contender that has had the trigger smithed by Rod Ellingsworth to the tune of about 1 lb. The wood set was purchased from Bullberry (see links) in the semi-finished condition. The barrel was bought from Virgin Valley Custom Guns, and is chambered for .17 Rem. It is 15" long full bull and matte finished stainless. Accuracy is enhanced with a BR model Harris bipod. The rig is topped with a Burris 3-12 EER scope with adjustable objective and target knobs. I have begun to work up some loads with the gun and am pleased with its performance thus far. 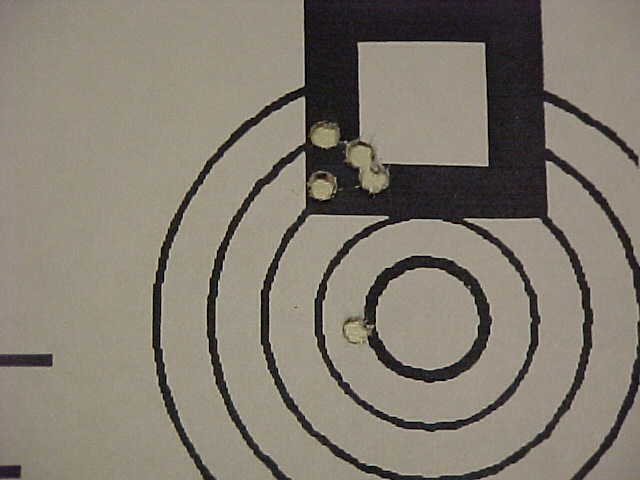 Just as a sample, I have included a picture of a target shot while breaking in the barrel. Disclaimer: The first shot out of the clean barrel went low and the remaining four went into .42", which you see below. Because they were all in the black part of the square, I did not see that the group was so good or I would have shot a fifth shot for the group. You can imagine my surprise when I walked down range to check out the target.